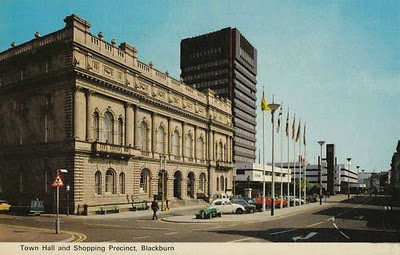 BLACKBURN PAST: Compare & Contrast - '62 or '72? Compare & Contrast - '62 or '72? Two photos / postcards with probably only a decade or so between them. I know which one I prefer. 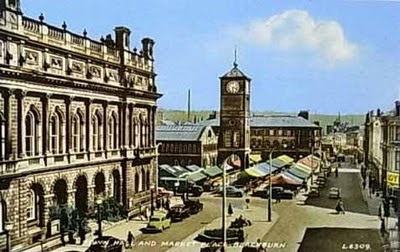 Being only 5 years old, when the buildings in the older image were demolished, my recollections are very vague and as most of the images I have seen of this scene are monochrome, were the canvas coverings on the market stalls really that colourful, or has there been a little 'tinting' added to the top photo? I certainly don't remember the stalls having coloured canvas awnings.If my memory serves me right they were a "Crappy" Grey colour.But then again I could be wrong,do you remember ny Feniscowles howler Colin !! I thought that might be the case John. The publishers of the postcard have obviously used a little artistic licence (and a few crayons). Blackburn Lad, do you possibly have any pictures of Mount Street ? I was born there and had to leave it when it was being pulled down, I would absolutely love some pictures of the Street if you do have any ? No, sorry I haven't. I think there's one or two on Cottontown, but finding them might be difficult. Have you finished with my book yet Roy?